It is easier to concentrate when you meditate. The effects are even more noticeable in creative endeavors, like writing music, and poetry, or painting a masterpiece. Many master artists and musicians, top-tier athletes and others who are considered ‘genius’ in their fields meditate. This is because the act gives you greater focus, more clarity and calmness, and instills creative ideas with more magnitude. Meditation also gives you patience, insight and perspective – all important brain states when you are trying to make something out of nothing. You won’t sweat the small stuff as much. When you meditate consistently,things that used to easily upset you seem to be ‘no big deal.’ You will find yourself reacting less to things and observing them more, with enough space between the ’cause,’ and your choice of ‘effects’. It is in this more mindful state that you can respond to life on different terms, and affect different outcomes. If someone is acting grouchy, you won’t as easily feel compelled to get pulled into their emotional state, and can instead, either neutralize it, or even better, lift them to a higher state of awareness, like joy, happiness, or pride. You’ll be less stressed in general. There are numerous studies which definitively outline the reduction in stress for those who are consistent meditators. The Mayo Clinic even talks about meditation as a stress reducer as well as an effective combatant to seasonal allergies. (Who can be calm when sneezing twenty times in a row?) You will reduce the fight or flight-response of the nervous system, and make more mood-boosting hormones like melatonin and seratonin when you meditate. High stress levels lead to a shortened life span and lots of health risks. Meditation combats both. You’ll experience better health and recover more easily from addictions. 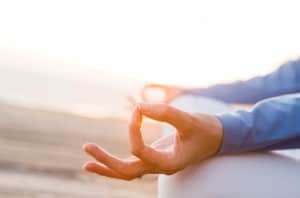 There is proof that meditation lowers high blood pressure, reduces cardiovascular disease, improves depression symptoms and turns back the clock on many physiological age factors. It is like the fountain of youth. It can even help you stop smoking or quit other destructive habits that you have had a hard time resisting with will-power alone.